To use the jPOWD applet, your browser must have the JAVA Virtual Machine (JVM) enabled. 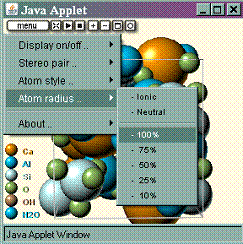 The jpowdjpx.jar MDI, Inc. is a web browser JAVA applet that can be integrated into web pages and uses .jpx files from jPOWD program for viewing crystallographic structure data in .jpx format. Click on mineral name in the Index of Mineral Structures for a large interactive display (jpowdjpx.jar Applet) of the chemical structure. 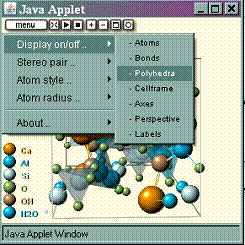 This applet requires Java and Specifically the SUN Java Virtual Machine installed/enabled on the client browser. If you have Java installed but no crystal structure appears in the window on the left, you probably have the obsolete MicroSoft Java Virtual Machine installed on your computer. See www.java.com for the proper Java plug-in required to view the interactive structural data. Follow this link for a discussion on mineral structures. Warning: This applet runs in your browser (client side application) and is very compute intensive. It may not run on older computers. Major new addition to Webmineral. View interactive crystal structure diagrams using jPOWD Applet. This applet is replacing the jMOL applet because it is smaller in size and it specializes in mineral and material structure files. The structure files are now integrated-with and viewable-by the species pages for each mineral that has published structural data. jPOWD from Materials Data, Inc. generates x-ray pattern and structure simulation 'by reading crystallographic structure files, such as *.cif and generates a simulated x-ray diffraction pattern from the atomic positions. The output of binary crystal files (*.jpx) from the jPOWD program and the jpowdjpx applet allows web display of crystal structures. Mineral Structures - Thanks for the tireless efforts of Dr Robert Downs and his associates at the University of Arizona for their crystal structure database. This database contains every structure ever published in the American Mineralogist, The Canadian Mineralogist, European Journal of Mineralogy and Physics and Chemistry of Minerals as well as other selected journals. These structure files contain over 14,000 entries. All of them have been downloaded from the American Mineralogist Crystal Structure Database, converted to .jpx files, and uploaded to webmineral.com. Q: When visualizing molecules containing oxygen, the spheres representing oxygen are tiny compared to the other elements like silicon or magnesium. A: Most mineralogists use cation positions to identify and classify structures in minerals. The jPOWD applet display shows atoms much smaller than the real radius so that this structure can be visualized. The default radius used by jPOWD is 30%. To change the default atomic radii, just use the menu functions in the applet. Q: The perspective picture gives polyhedra which are not relevant to the structure. A: The jPOWD program has a batch converter which allows the creation of .jpx files. With over 14,000 structure files available from the American Mineralogist Crystal Structure Database, the batch process uses program settings which may not be optimal for all crystal structure files. Some of the resulting .jpx files may be incorrectly formatted because of ambiguities in the source .cif files. In all cases the original references are provided to verify the crystal structures. If you need publication-quality displays I would suggest you get a copy of jPOWD. That way you could tweak the display to your liking on an individual basis. Contact them at materialsdata.com. Sometimes a refresh of the web browser window will re-initialize jpowdjpx.jar applet. Try clearing the browser cache and restarting the browser. Try a different brand of web browser (always use an up-to-date version). Check the JAVA Virtual Machine version. It must be from SUN (www.java.com) and it should be newer than version 1.0 (jpowdjpx.jar applet was checked on version 1.5.0_06). Be sure the computer has sufficient memory available. The jpowdjpx.jar applet may not be able to run on computer with minimum memory. Try running the page on another computer. If jpowdjpx.jar will not initialize on a particular structure file but works on other structure files then it is possible that the .jpx file is malformed. In this case your only remedy would be to contact me at . Help file image instructions for jpowdjpx.jar. Structure files from the American Mineralogist Crystal Structure Database contains data for synthetic minerals as well as data for non-mineral materials. Many of the crystal studies were done for temperature and pressure effects. In all cases, the original reference should be consulted for details. The level of programming involved in the use of jpowdjpx.jar requires the latest version of the SUN Java Virtual Machine. Older versions of JAVA may not or will not work. 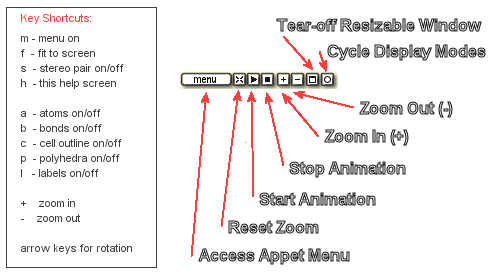 In addition, older versions of web browsers may show quirks in the display of the structure applet. It is recommended to use the latest version of web browser. All binary crystal structure files (.jpx) on this website are the property of Webmineral.com. The applet used for the web display of those structure files (jpowdjpx.jar) is copyrighted by Materials Data, Inc and is used with permission on webmineral.com. In keeping with the "fair use" copyright doctrine, webmineral will allow the reproduction of a limited number of .jpx files from this website for educational use as long as credit is given to webmineral.com as the source of the .jpx files and credit is given to Materials Data, Inc. for the jpowdjpx.jar file. Any other use (no citation given, large numbers of files being reproduced, commercial work, etc.) will be considered an infringement of copyright if prior arrangements have not been made with webmineral.com or Materials Data, Inc.